RAC Audits: “The Big Bad Wolf” Is Coming to Medicare Advantage…Soon! Beware! But the above explanation fails to paint the whole picture. RACs are compensated by contingency fees. In other words, the more claims they find noncompliant, the more money they are paid. Plus, RACs extrapolate their findings. If a RAC finds $6000 in noncompliant claims, then they extrapolate that number across a universe (usually three years) and come up with some exorbitant number. See blog and blog. The financial incentives create overzealous auditors. What type of providers accept Medicare Advantage? Advantage providers include optical providers, some durable medical equipment (DME), dentists, nutritionists, and some providers of wellness programs. The Medicare Advantage recipients usually pay a premium. Approximately 15.8 million people rely on Medicare Advantage policies. CMS has been looking to implement the RAC program on Medicare Advantage for months…if not years. Now, it appears, that the RAC program will be leashed on Medicare Advantage very soon. CMS released a request for information in December 2015 on how to incorporate RACs into Medicare Advantage, but made little progress until recently. My “sources” (ha – like I am a journalist) have informed me that the RAC program will soon be released on the Medicare Advantage providers. So be forewarned!! When is sales tax due on your DME-related sales and services? The North Carolina Business Court Weighs In. Sales tax compliance may not be the reason you are in business, but consequences can be very serious if you fail to collect and remit sales taxes on a taxable transaction. Durable medical equipment suppliers (DME) should take note of a recent decision by the North Carolina Business Court in which the DME supplier (at least according to the Court) erroneously thought that certain DME sales were exempt from use tax. In Feeling Great, Inc. v. North Carolina Department of Revenue, 2015 NCBC 81 (N.C. Business Ct. Aug. 20, 2015), the DME suppliers did not collect and remit use tax to the Department of Revenue on the basis that the purchases at issue (medical supplies used in sleep study testing) were exempt from sales and use tax under N.C. Gen. Stat. 105-164.13(12)d. That statute provides that sales of “[d]urable medical supplies sold on prescription” are exempt from sales tax. Seems straightforward, right? The Department of Revenue, however, issued a tax assessment for sales of supplies used in sleep study testing in connection with a diagnostic sleep system machine. The sleep studies were covered by Medicare or Medicaid and were not part of the tax assessment. It was the supplies used with the sleep studies, such as cleaner, sensors, gauze tape, Q-Tips, and the like, that the Department took issue with because the physicians’ prescriptions did not specifically mention the supplies as having been prescribed, only the sleep studies! Feeling Great’s problem was that the prescriptions did not specifically refer to “supplies” associated with the sleep studies. Instead, the physician only “prescribed sleep study testing for the patient.” Had the prescription included “all supplies as needed” in the description, the court implied that the result would have been different: sales of such supplies would have been “on prescription” and therefore exempt from sales tax. Feeling Great’s many arguments to the contrary, including that “Medicaid routinely authorizes the purchase of durable medical equipment and associated ‘supplies’ under a single prescription” (which the administrative law judge had found), were not accepted by the Business Court. It may seem odd to distinguish between a prescription that prescribes sleep study testing and a prescription that prescribes sleep study testing as well as needed supplies for the machine, but it is the distinction that caused a significant sales tax assessment for the taxpayer in this case. DME suppliers should carefully review the prescriptions and be mindful of the Department’s position when collecting sales and use tax. CMS has announced that it will add a 5th Medicare RAC to focus on home health and durable medical equipment (DME). Obviously, with the aid of a 5th RAC, the other RACs will have more free time to focus on other health care providers. 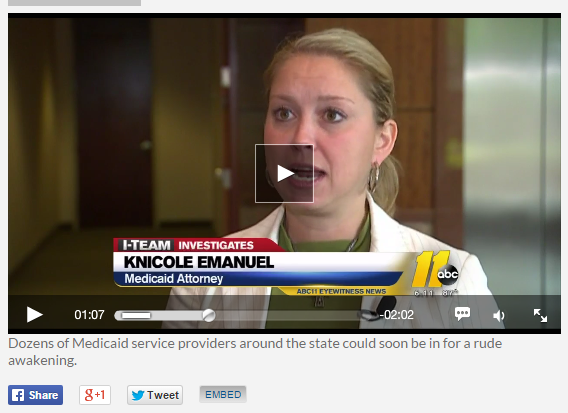 So what does a 5th RAC for Medicare mean for Medicaid in North Carolina. First, many providers that accept Medicare also accept Medicaid. The two programs do have some commonality. Also, NC started out with one RAC. As the federal government increased the number of RACs, NC has slowly increased the number of RACs. We started with Public Consulting Group (PCG) in January 2012 and added HMS October 2012. Then, of course, we have The Carolina Centers for Medical Excellence (CCME), approved through an RFP, performing “Quality Improvement Strategy functions” on the behalf of DMA. 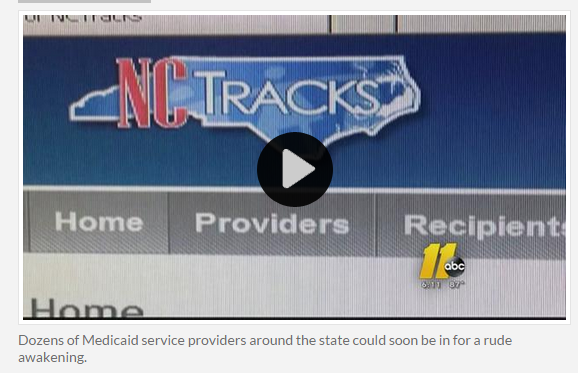 Expected Future for NC Medicaid Providers? More and more and more and more audits. Remember the ant in the “Ant and the Grasshopper?” If not, here is the fable. So, providers, be the ant! Similarly to the Salem witch trials in Salem, Massachusetts between February 1692 and May 1693, there has become a sort of mass hysteria surrounding Medicaid fraud. While, obviously, Medicaid fraud needs to be found and fully prosecuted, who is to determine whether document noncompliance is fraud? Or harmless and inadvertent error? The witch-smellers? Good gracious, who can honestly tell me that they understand every aspect of Medicaid billing, including all of the federal statutes germane to Medicaid, and all the terms within DMA Polices and what exactly the terms mean? Medicaid is esoteric stuff. Surely, providers deserve some leniency as to inadvertent errors. Yet it seems as though the North Carolina RACs auditors are of the mindset that any error, however small and insignificant, causes noncompliance and the reimbursement for services rendered must be recouped. According to the AHIMA website, the RAC Program’s purpose is to reduce improper Medicare/Medicaid payments and implement actions to prevent future improper payments. But who defines “improper?” Is there an element of intent? I guess I would also be of the mindset that all errors constitute noncompliance if I were paid 12.8% of what I recouped, too. So what defenses do providers have? Back in Salem in 1692-1693, the accused witches would plea, “No. I am not a witch.” Providers are claiming, “No. My documents are compliant.” But when the accusor has more power than the accused, the accused plea of, “I did not do it,” falls on deaf ears. The U.S. Court of Appeals described 42 U.S.C. 1395pp as “the statutory section [that] allows a [health care provider] to obtain a waiver of liability for overpayment receipt when coverage is later denied and the individual beneficiary of the [health care provider] “did not know, and could not reasonably have been expected to know, that payment would not have been made for such [services]”…” MacKenzie Med. Supply, Inc. v. Leavitt, 506 F.3d 341, (4th Cir. 2007). 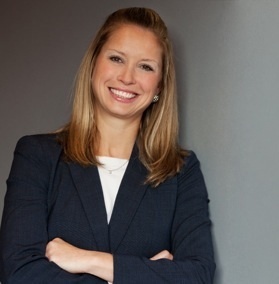 The MacKenzie case dealt with a durable medical equipment provider. The case actually did not end well for the DME provider based on the provider relying on Certificates of Medical Necessity as a sole basis for medical necessity. There has not been a ton of case law in which the provider asserted this “no fault” defense, so we really do not know the limitations or breadth of the defense. But, the “no fault” defense should definitely be in the arsenal of defenses for the providers undergoing recoupment actions. Let’s say, one arrow in the quiver of defenses. I am sure that the witch-smellers back in 1692-1693 had a personal investment in finding witches. I mean, who wants to live in the same community with a witch that could possibly put a spell on you? Similarly the RACs have personal investments in the way of monetary incentives to cite noncompliance. One way in which the citizens of Salem determined whether someone was a witch was the “Touch Test.” If the accused witch touched the victim while the victim was having a fit, and the fit then stopped, that meant the accused was the person who had afflicted the victim. Yet as ridiculous and asinine as the Touch Test sounds, people believed the witch-smellers. Even lawyers and judges believed the witch-smellers. But because of the mass hysteria of the witch hunts, the witch-smellers were believed. Today’s mass hysteria of Medicaid fraud is allowing the RACs to be overinclusive when determining noncompliance. The state has asserted that, if there is grey area, the state errs on the side of the provider. From what I have seen, I believe that the state errs on the side of the providers as much as I believe in the “Touch Test” to determine witchcraft.